Four years ago Army senior fullback Darnell “Butch” Woolfolk had yet to pick up his nickname and had just about lost hope of fulfilling a dream to play Division I college football. The silence was deafening as the February 2014 signing date approached. Woolfolk was prepared to sign with an NCAA Division III school, but then Jeff Monken was hired as the Black Knights’ new coach. As Monken scrambled to form a coaching staff and sign recruits, Woolfolk suddenly found himself a last-minute addition to Monken’s first Army recruiting class. The program turnaround wasn’t overnight, but the last two years Army has finished 8-5 with a win over Navy in 2016 and 10-3 with a sweep of Air Force and Navy to capture the Commander in Chief’s Trophy in 2017. Woolfolk, a 5-foot-9, 235-pounder, has contributed a total of 1,412 yards with 23 touchdowns as a sophomore and junior. His career per-carry average is 5.3 yards; his career highs are 132 against Temple last year and a pair of three-touchdown games. The story he has to tell is a prime example of how Army takes lightly recruited athletes, develops them and properly places them as pieces to a puzzle that allows the Black Knights to compete against teams with more highly recruited Division I athletes. Asked to offer a year-by-year review of his surprise Army career, Woolfolk provided a first-person narrative at the process that has resulted in him contributing to Monken rebuilding Army’s program as the Black Knights’ fifth-year head coach. Army opens the season Friday night in a televised game on ESPNU in its first of two games against Power 5 opponents. The Black Knights travel to Duke on Aug. 31 at Wallace Wade Stadium and three weeks later play Oklahoma on Sept. 22 at Memorial Stadium. 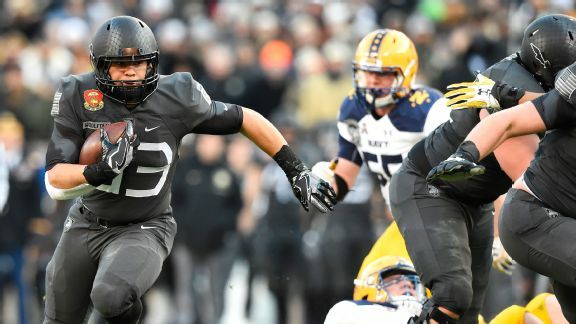 In Army’s Commander-in-Chief games, the Black Knights play Air Force on Nov. 3 at Michie Stadium and the 119th Army-Navy Game is Dec. 8 at Lincoln Financial Field in Philadelphia. I definitely wanted to continue playing college football after my experience at Maine-Endwell High in upstate New York. We were a team with a close bond among players and coaches alike. That left me about to commit to Ithaca College, but I was surprised by another phone call from Loose. This time he was calling as an Army assistant coach on new head coach Jeff Monken’s staff. Why my running style wasn’t enough at Lafayette I still don’t know, but I didn’t hold the original rejection against coach Loose. I was ecstatic when they invited me to visit West Point. I just wanted a chance, and I feel blessed that Coach Monken and Coach Loose gave me this opportunity. My parents made the trip with me and they fell in love with this place. I liked how close everybody was, especially the coaches. You can tell how well an organization is run by looking at the top. That trickles down. We were a close team in high school and I felt I could have a similar experience at Army. Prior to Coach Monken’s hire, I had never heard from Army, Navy or Air Force, so I hadn’t thought about attending a military academy. The military school lifestyle was a culture shock for those of us without a military background. My first year I attended the U.S. Military Academy Prep School along with other recruits that weren’t direct admits to West Point. It was a tough year, but hard times bring you together to form a brotherhood. On the football field, we had a good year playing at the prep school. We were optimistic we could make an impact when we played for West Point’s varsity team that is known colloquially as Big Army. I’m one of 14 seniors from Coach Monken’s first class that spent our first year at the prep school. There are 10 other seniors on our 2018 roster, with eight that arrived in 2015 as direct admits, one that missed a year with an injury and is a fifth-year senior and one that is a Georgia Military College transfer. The football jump from the prep school to Big Army was the biggest I made in the sport. I remember being told in high school I faced a big jump moving up to varsity football. I heard it again with the jump from high school to prep school, but I didn’t feel it until my first year at West Point. Everything was so much faster. When I get the ball, I have to hit the hole or it will close quickly and I’ll be tackled in the backfield. Most of my playing time was on special teams my first year, with only a few snaps as a fullback. I didn't have any carries, but I caught a pass for 18 yards. Our 2-10 record was discouraging, but we understood we were competitive, losing six games by five points or less. Two more were by touchdown or less. We played Penn State tough on the road, losing only 20-14. We were beating Navy 17-14 until Navy quarterback Keenan Reynolds, who was fifth in the Heisman Trophy voting that year, threw his second touchdown pass to beat us 21-17. Despite our 2015 record, the close losses encouraged us that we were close to a breakout season in 2016. Everyone was pushing it in the weight room, in the off-season, in the spring and throughout the regular season. We had great leadership from our seniors and team captains. We finished with an 8-5 record, which was Army’s first winning season in five years and only the second in 17. Our victory in the Army-Navy Game ended a 14-year losing streak to our rivals and was a great relief for everyone associated with Army around the world. “Beat Navy” is always our primary goal at West Point. I don’t think it hit us until we took a knee on the final snap. When the cadets and fans came out of the stands to run onto the field at M&T Stadium in Baltimore, it was one of the greatest memories I’ll ever have. I began the season as a backup to Andy Davidson, but I played enough to pick up the nickname “Butch” from defensive coordinator Jay Batemen. He was referencing Butch Woolfolk, Michigan’s Big Ten rushing champion in 1981 who played seven NFL seasons. I finished the year with 109 carries for 600 yards, a 5.5 per-carry average, and nine touchdowns, but a lot of the credit goes to our offensive line. It was actually a breakout year for the fullback position. Andy led the team in rushing with 961 yards and 12 touchdowns. Again, the team came together with great leadership. We wanted to improve upon our 8-5 record and pushed more than ever to sweep Air Force and Navy to win the Commander in Chief’s Trophy. We were feeding off each other in workouts and practice. That was our attitude throughout the whole season. Actions speak louder than words, and we weren’t just talking about it. We were doing it. When we beat Air Force for the first time in five years and Navy for the second-straight season, it was the first time the Commander in Chief’s Trophy returned to West Point since 1996. We also beat San Diego State in the Armed Forces Bowl in Dallas for a 10-3 record that matched the win total of the 1996 team’s 10-2 mark. I was slowed down by a mid-season injury and missed three games, but overall I improved enough to top my 2016 rushing total. I gained 812 yards, a 5.2 average, with 14 touchdowns to finish tied with quarterback Ahmad Bradshaw in touchdowns and second to his 1,746 yards rushing. We’re back with the same common goal of everybody playing for each other. This will be the third year in a row Andy Davidson and I share the fullback job, and we’ve combined for 1,000-plus yards the past two seasons. We totaled 1,561 yards and 21 touchdowns in 2016 and 1,439 yards and 19 touchdowns in 2017. It’s great to have depth at our position. A fullback gets hit on every play in our offense so having one of us in the game for three to six plays grinding and then sending in a fresh pair of legs off the sidelines is tough on the defense. Last year we had two additional productive fullbacks with Connor Slomka and Calen Holt in the mix. Slomka, also a senior, added 49 carries for 216 yards and four touchdowns, while Holt, now a junior, chipped in 214 yards and one touchdown on 42 carries. That’s a total of 1,869 among the four of us to contribute to Army leading the nation in rushing yards and rushing touchdowns. We finished with 4,710 yards, good for 362.3 per game, and 50 TDs. Time has gone by quickly, but the message from Coach Monken has remained the same. If we do the little things, execute our fundamentals, win on third downs and win the fourth quarter then everything will fall into place and we’ll win every game. That’s been the message from him since day one. It’s a new year and everybody is eager. Our senior class is excited to be going into its final season and then graduating into the Army as officers.